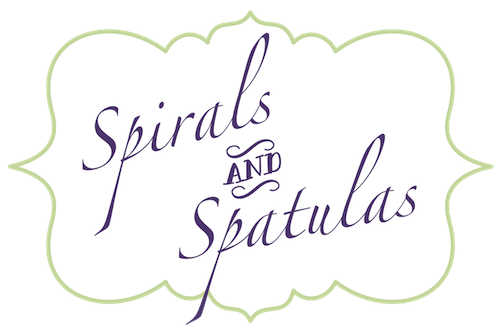 Spirals & Spatulas: The New (Used) Car! This was definitely a splurge for us, but it's something we've planned for and included in the budget for a long time, and we're excited. My Mazda was getting old and starting to have some problems, so we've always planned on replacing it around the time I started work. We did a lot of research and a lot of driving around looking at various cars, and we decided on the G37 for its good engine and good reliability long-term (Jeff), and its prettiness (me). And then we thought, well, if we're going to get it, why not get the convertible version? Wouldn't that be fun? I had a moment where I was freaking out about buying the convertible... what will we would do down the road when we have kids, we'll need another car to fit carseats in, etc. But my frugal father-in-law and my sensible mother both told us that we should just buy the convertible while we're at a time in our life when we can, and worry about the rest later. So that's what we did. Years from now, we'll always be able to look back on that time early in our marriage when we went on dates in a cute car with the top down, and that's kind of fun to think about. The flip side of this whole car-buying scenario was that we had to sell my Mazda. My dear, beloved Mazda. I cried more than once over this. That car has been with me for a long time, and I know this is silly, but I just feel like it was a loyal, friendly, dependable car, and I feel like I'll never love another car again like I did that Mazda. 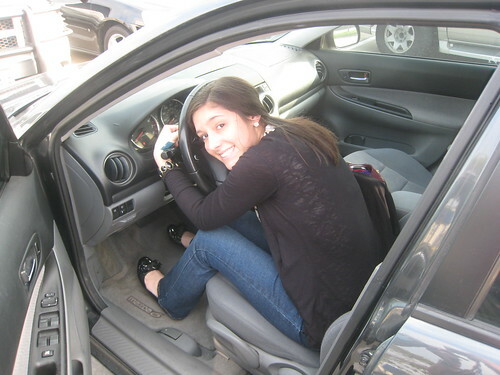 I have so many memories that involve that car. The first time Jeff and I ever had a longer-than-normal hug and a real conversation about whether we wanted to be more than just friends was sitting in the Mazda after Homecoming in 2006. In 2007, I woke up on my last day of high school to find that my parents and sisters had painted all over the windows with sweet messages. 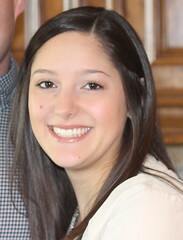 When I drove to College Station to move into my freshman dorm, I was in the Mazda with all of my clothes and stuff filling the backseat. It's the car that took me on many college roadtrips. I drove that car for last-minute wedding errands in 2010 with my bridesmaids, blasting our bridesmaid mix CD. So many memories. So when we took it to be appraised at Carmax, it was with mixed emotions. 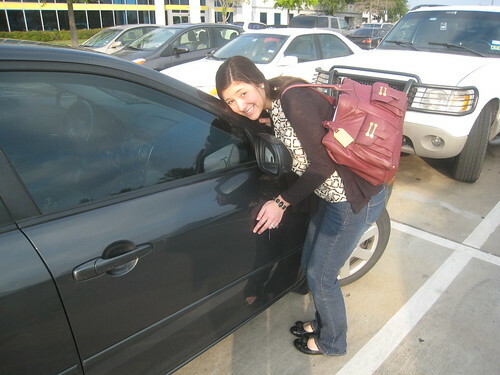 But the Carmax people offered us over $2,000 more than Kelly Bluebook said it was worth, so we left happy. 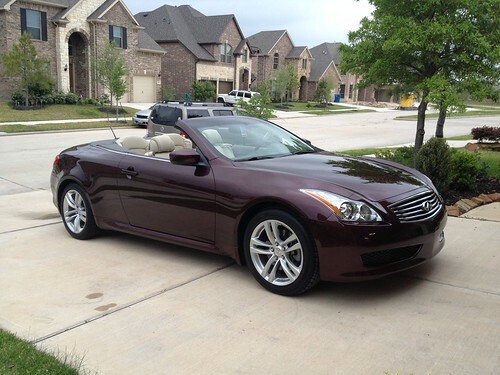 The Infiniti dealer couldn't even come close to matching the Carmax offer, so we took Mazda to Carmax to sell him. And then I went in and signed some papers and handed over the keys and left, and now I'll never see that car again. It still feels really weird. I cried while I was signing the papers, and I tried to play it off like I had a cold, but the guy was finally like "umm, are you okay?" and I had to say "I've just been driving that car for a long time." He probably thought I was insane. 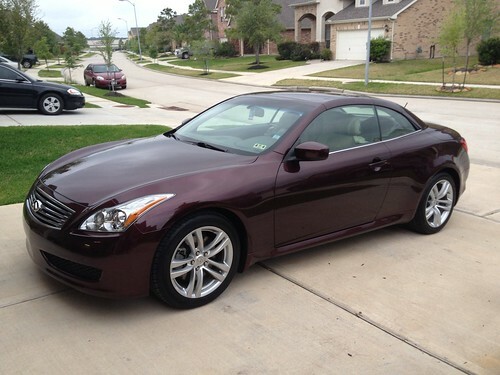 But then I drove the G37 home, and oh boy - that thing can accelerate fast. It's a fun car. I think I'll grow to love it too. Love love love that car!! I totally agree that you did the right thing buying the convertible now while it's still practical for you! It's BEAUTIFUL! And funny story-- when I was little and my parents traded in one particular vehicle, I wouldn't get out of it at the dealership. My parents had to physically remove me from it because I was crying and holding on to it. Hahaha! I know I'll be sad when I get rid of this car-- it's been through a lot with me! So, I don't blame you at all. I have a feeling I'll be sad when I sell my Jeep. My dad bought it new then gave it me, so it's been in the family a looonnnggg time. Hope the new car works out! Although I have grown to appreciate my other cars(I switch between two with my dad), my first real car is still my first love and I miss it. At least you got to say goodbye, I didn't have that opportunity. So, if you fell crazy, your not alone. Pretty much the exact opposite of us (with spit-up stains on most of our clothing). Ha!